The Ellipsometry is a total optical measurement method. This technique is used to measure the change of polarization of light when passing through a medium. Due to the layer structure during reflection the polarized light exhibits distortion, which permits users to extract the material properties of the medium in this structure. The distorted polarization can be established using a number of techniques in which different optical components modulate the light polarization. Semilab employs the most advanced rotating compensator layout, where a high-end, broadband compensator introduces variable phase shift dependent on the rotation angle in order to establish the ellipsometric elements spectrally. Modeling and parameter fitting for the actual structure are required to extract the thickness and the refractive indices values, this is because ellipsometry is an indirect metrology. Semilab's Spectroscopic Ellipsometry Analyzer (SEA) software supplies a wide scope of techniques to create models for the actual structures and powerful algorithms to fit the model parameters to acquire the values of interest. The Spectroscopic Ellipsometry measurement technique has a number of benefits. Firstly, it is an optical method, meaning it is non-contact and non-destructive. 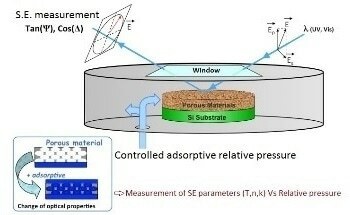 Using a multilayer structure the thickness and optical functions of each layer can be calculated. 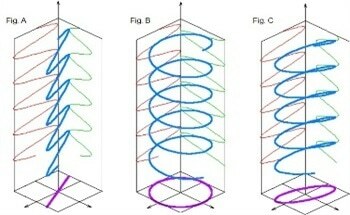 It is based on measuring the phase shift of a light beam which travels through a layer structure so it possesses high sensitivity, and the phase angle measurement does not depend on the absolute intensity of light. Spectral information about the sample can be obtained by utilizing white light sources and monochromators. The ratio of the complex Fresnel reflection coefficients are measured by ellipsometry. It can be divided to an amplitude term as it is a complex number, and a phase shift term, which corresponds to the ellipsometric angles, Ψ and Δ. These parameters contain the physical properties of the layer structure, such as the layer thickness and refractive index. This is a transcendental and highly nonlinear equation, so it must be solved using numerical techniques, on a model-based approach. The layer structure is considered with thickness and optical functions in the model throughout this procedure. The relative phase shift is determined and compared to measured quantities during a numerical regression procedure. This information has been sourced, reviewed and adapted from materials provided by Semilab. For more information on this source, please visit Semilab.